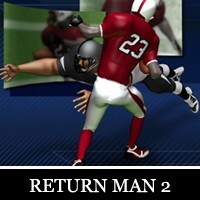 You love action games? You don’t like violent battles? You like cute animals? You are waiting for a game that matches with your hobbies? 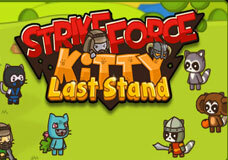 Strike force kitty last stand is right here to satisfy you. 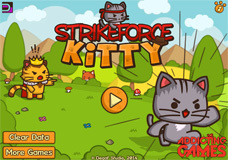 Strike force kitty last stand is a game in the series of games named Strike force kitty. The series was developed by Deqaf Studio. There are two versions were released before this. All three versions of the series have their owned good points. However, the different of them are significant. 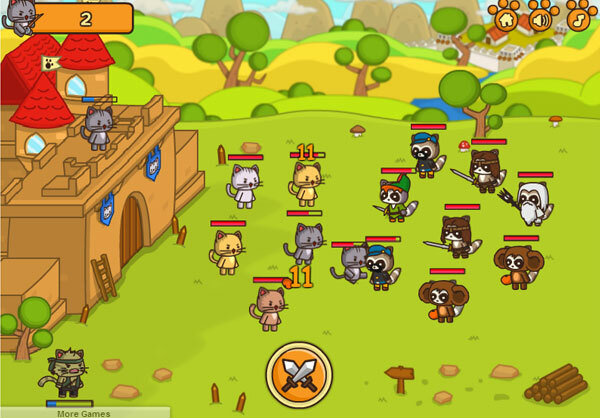 In the two versions before, you play as four kitten soldiers, they have to go on a way to find the princess or find the aggressor. 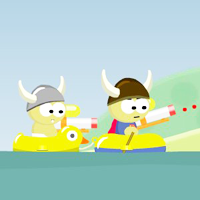 On the way, they have to face up with many kinds of enemies and hinder. They have to beat all the enemies or get through all the hinder to go to the end and complete the missions the king gave them. 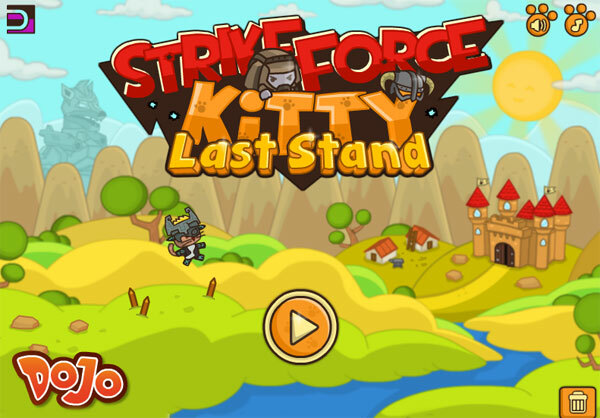 However, in this version, you play as six kitten soldiers. Your enemies found your fortress and want to come in to attack the king. Your mission is to fight with the kitten soldiers to prevent the enemies from come in. 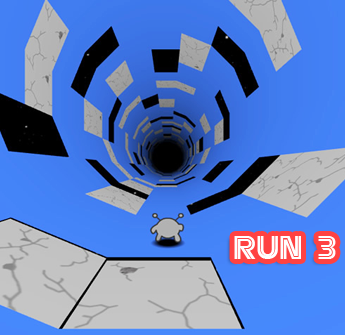 Different from the two versions before, all the enemies approach to attack you continuously. 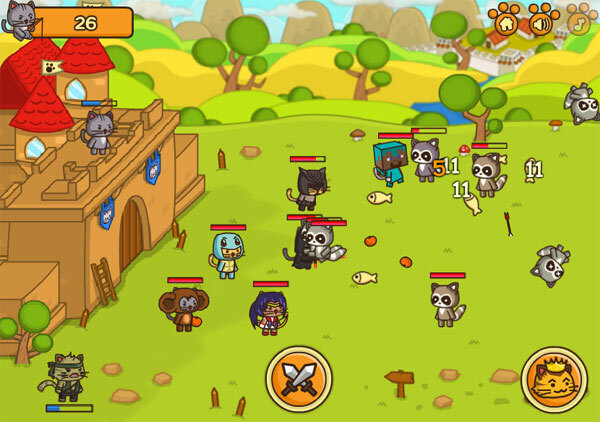 The bacons, the foxes arrive at the front of the fortress and your kitten soldiers have to have battles versus them to protect the fortress safe. This version is much more difficult than the two ones. There are some reasons to explain for this. First, the waves of enemies approach and attack unstoppably. Another reason is the number of the enemies is very big. Moreover, they become very dangerous, which makes it hard for your kitten soldiers hard to defeat them. In addition, if one of the kittens is knocked out, it will be brought to the hospital for treatment, but the time of the treatment is very long and the battles are not stop for the kitten soldiers to recover. Therefore, if you kitten soldiers are knocked out, the other will have to continue fighting until the injured soldiers come back or until all of them are knocked out. 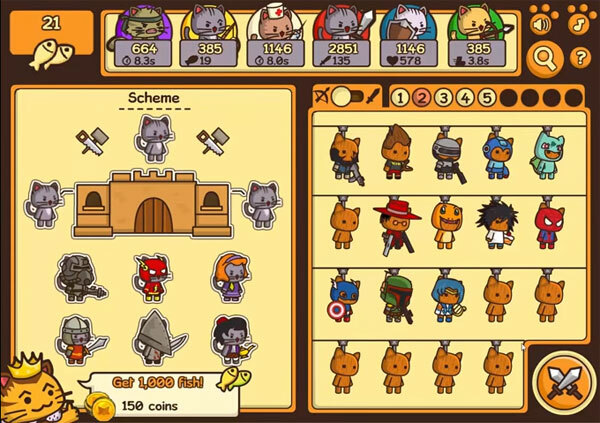 After all, if you want to win in the game, you have to try your best, grab lots of clothes and weapons, so that your kitten soldiers can fight continuously.